The new Nokia E6 has finally been announced after months of rumours, bringing with it a touchscreen/QWERTY combination. The new E6 features a 2.46-inch VGA touchscreen, which Nokia told TechRadar at a journalist briefing is 'class-leading' thanks to over 300dpi in such a small footprint. An 8MP camera has been wedged on the back, which is also capable of HD video recording, and the touchscreen has been optimised for thumb use - which we assumed means bigger icons and less smudging. 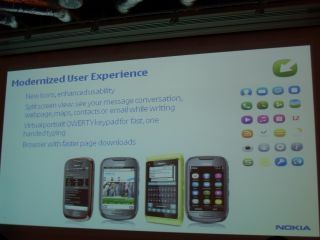 The Nokia E6 is running the new Symbian Anna platform, meaning faster web browsing, improved homescreen widgets and better Ovi Map features - which will all be present when the phone launches. The Nokia E6 UK release date has been given a fairly woolly Q2 time frame with no UK pricing as yet, but we've got high hopes for a more budget price tag if it will match the likes of the E71 and E72.